The Freshman Girls Basketball Team finished their season Monday with a 27-21 loss to Plymouth. The Lady Eagles were led by Adia Williams with 10 points. the team finishes the year with a 4-8 record. Congrats to Coach Butler and the team on a hard fought season. 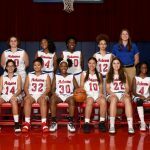 The Girls Basketball team wrapped up the regular season Saturday night with a 55-47 loss to LaPorte. The Lady Eagles were led in scoring by Sabrina Malone with 10, and Sam Jankowski with 7. The Eagles finish the Regular season 14-9 and will again play LaPorte in the opening round of the sectional Tuesday at Clay. The Freshman Girls Basketball team beat New Prairie Monday night 26-25. Adia Williams led the way for Adams with 10 points. The Freshman finish their season next Monday at Plymouth.